Mariners Football Team DigIB will publish all Stories, Personal or Team Tributes and Photographs submitted by Readers all this week or as long as the Mariners keep playing. 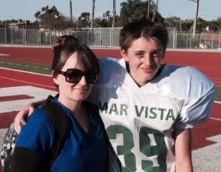 As part of a Tribute to the 2015 MVHS Mariners Football Team Project by DigIB, a Mother helps with Photos and Tribute to her Son as DigIB requests your Photos for Project. when you lose. Never discouraged ,always positive and ready to persevere. You work through pain and injury, never wanting to disappoint, and you never do. your all ...May all of you be blessed in your future endeavors! We know you are all going to do big things in life ..what a privilege that IB is able to share these great moments with you. I am your # 1 fan! Dream big, work hard , play harder! 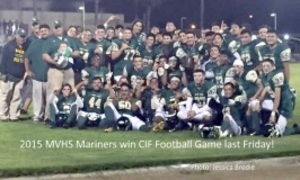 Note: John is shown in photo with team members Miguel Guerrero # 54 and Isaac Guerrero #57. 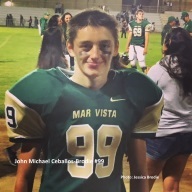 I would like to Thank Jessica Brodie for contributing to DigIB's Tribute to the 2015 Mar Vista High School Football Team! This publication is being done for the great community of Imperial Beach. The more the community participates and sends in information the better community publication we can have! Thank you to all those that help in any way! Thanks to your great support we have had over 23,000 pages viewed in the last 30 days with over 8,000 site visits and over 5,000 visitors. 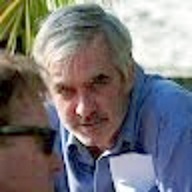 A Google Analytics Report for November 21st is available upon request.